He was the fifth Acharya of Terapanth Sect. He was born on the eleventh day of bright lunar month of Chaitra Vikram Samvat 1897 in Bengani family of Bidasar. His father's name was Puranmalji and mother's name was Gulaba. Both the brother and sister were beautiful and intelligent. Those days, Yuvacharya Jeetmalji happened to have stayed at Bidasar for chaturmas . The seed of initiation into asceticism sprouted in the minds of mother, son and the sister. All the three were anxious to get consecrated simultaneously but Gulaba had not yet reached the prescribed age for initiation into asceticism. This became a hurdle and the mother had to pacify her passions-but the child Magharaja was in a haste to become a Muni. Any kind of delay was unbearable for him. He therefore got permission of his mother and presented himself before Yuvacharya Jeetmalji, he told about his anxiety and started learning the essentials of religion, Jayacharya realized within the child unprecedential ability of grasping on the twelth day of dark lunar month Vikram Samvat 1980 the child was consecrated by Yuvacharya Jeetmalji at Ladnun. Acharya Raichand ji at that time was staying at Rawalia in Mewad. Some one sneezed thrice at the time when news of Muni Magharaj ji consecration reached him. It was considered auspicious. He said at the time of first sneeze that the Muni shall be intelligent, at the time of the second sneeze said that this Muni shall wander as leader of the group and at the time of third sneeze he said this muni shall be the successor of Muni Jeetmalji. Words of great men do not go as waste. The words uttered by Raichandji proved to be correct. He became a successor of Jayacharya ji. While in the auspicious company of Jayacharyaji Muni Maghraj ji made multifaced studies in development. He was born with the natural instincts of humblity forbearance, and fear from sins. He had an amazing devotion for his acharya and the acharya in turn had profoundly based on mutual devotion and affection towards him. This is a unique example of harmony between Guru and the disciple based on mutual devotion & affection. Muni Shri Maghrajji was possessed of profound personality. He was an awakened, consentient steadfast ascetic. His memory was very sharp. He never forgot the scriptures once memorized. He was also dear and reliable of all the ascetics. Once a Muni made some mistakes. The matter was then referred to five arbitrators who were appointed by the Acharya. H4e said to Jayacharyaji that he did not expect justice in this case when the decision was ready to be delivered. Jayacharyaji asked as whom did he have faith and if he had faith in Maghrajji. The ascetic gave consent immediately. On the same day Maghrajji was appointed as head of the five arbitrators. Maghrajji was then only fourteen years at that time. Considering his extraordinary ability Majjacharya stalled Muni Maghrajji his Yuvacharya in Vikram Samvat 1920.He was then twenty four. He remained Yuvacharya for eighteen years. He relieved his acharya of his work load by taking over the responsibilities of numerous important works of his Acharya. He became Acharya in Vikram Samvat 1938 after Jayacharya's death. After the demise of Jayacharya he shouldered the responsibilities of Terapanth Sect in Jaipur. Amongst all the Acharya's of Terapanth Sect, he was the most tender hearted. He never gave a strong reproach to any body. Even at some body's error he used to say, “I have to say when you make mistakes.” His very polite attitude in disciplining of the sect was a unique experiment of non-violence. 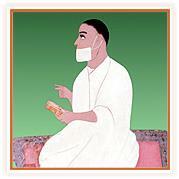 During his period he provided a solid foundation to the tradition of Acharya Shri Bhikshu. He has initiated a total of 36 males and 83 females ascetics during his tenure of Acharyaship. He died on the fifth of dark lunar month of chaitra 1948 in Sardarsahar.